Since the space race of the 1950s and 60s, politicians and economists alike have linked math and science education with the United States’ ability to compete on a future global stage. In the 1990s the National Science Foundation coined the acronym “STEM”— science, technology, engineering, math —in an effort to emphasize their co-dependence. Now a commonplace term, STEM has come to represent interdisciplinary education and the real-world application of math and science principles. FSB architects and engineers have been designing education buildings for decades, and actively work to incorporate the most up-to-date educational methods into these designs. Though their curriculums had begun embracing STEM-style learning years earlier, Edmond Public Schools believed designing Heartland Middle School could be an opportunity to bring cross-discipline, collaborative learning into the building itself. When they first enlisted the help of FSB in 2014, the district said they wanted Heartland to be the model for the next generation of middle schools in Edmond. District stakeholders traveled around the country with FSB to tour peer institutions that were advancing education forward through their facilities in ways that Edmond Public Schools might emulate. Back home, FSB’s project team guided teachers, principals and district leadership in an interactive problem definition exercise to set design goals and objectives. To promote the kind of interdisciplinary learning experiences that STEM-focused educators seek to provide, FSB equipped Heartland Middle School with classrooms designed to be extremely flexible and adaptable and rich with technology. At Heartland, classrooms are grouped into pods of five or six, centering around a common area where two or three classrooms can congregate at a time. A math and science teacher might collaborate and integrate a math concept with a scientific application, Schmidt said. It’s a design feature that has been well-received at Heartland as well as in other learning environments, because it creates opportunities for instructors to show students how subjects overlap. Access to a variety of learning environments can increase creative thinking; FSB created an indoor “learning stair” and outdoor classroom areas at Heartland in an effort to bring this variety to students. Architects and educators have a name for spaces like Heartland’s learning stair and common collaboration areas— “soft interactive spaces”. 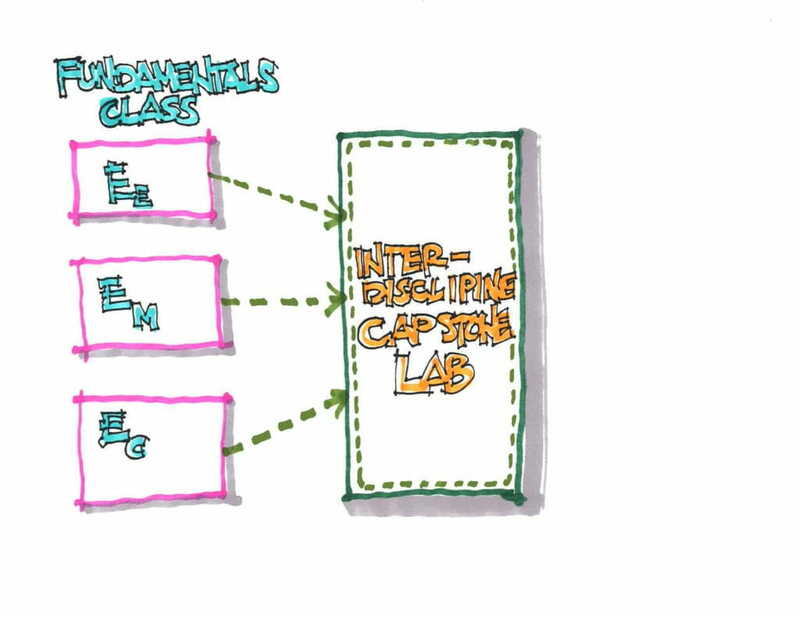 These areas are characterized by offering a variety of seating arrangements, where students can interact with their peers and instructors on campus in non-traditional classroom environments. Many educators believe soft interactive spaces enrich learning by encouraging discussion and collaboration outside of the classroom. Schmidt said it’s important to incorporate an infrastructure that will support technology in the classroom. Many of Heartland’s classrooms are equipped with document cameras, handy for projecting a real-time video feed of up-close work, like solving equations, doing an experiment or tinkering with a piece of machinery; smart white boards detect and record anything written on the board onto a computer. Like all schools the firm has recently designed, Wi-Fi access is available throughout the entire building. 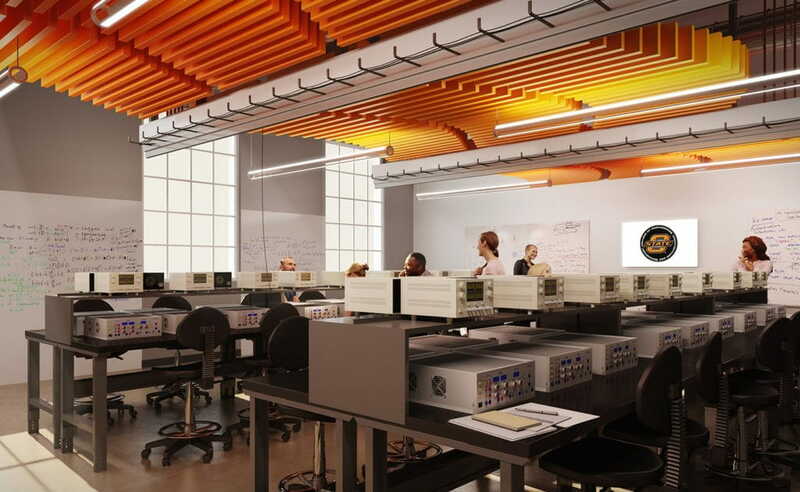 After working with FSB to complete a graduate laboratory facility, Oklahoma State University’s College of Engineering, Architecture and Technology re-engaged the firm to return and design the new undergraduate laboratory building. For the first time, the labs for undergraduate civil, structural, mechanical, electrical and aerospace engineering, architecture and technology students will be housed in one building, designed intentionally to facilitate collaboration and the sharing of knowledge and resources throughout the College. Here, soft interaction spaces equipped with smart boards will be sprinkled throughout the building, providing areas where professors and their students can meet outside of a classroom setting, have some “chalk talk” about a formula, or simply access the internet. Schmidt said that, when completed, the building will likely play a role in shifting curriculums toward integration between disciplines. 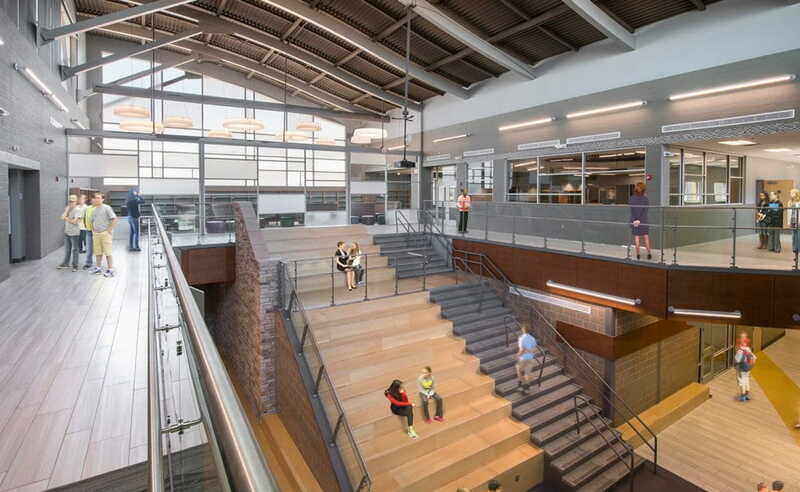 The space, Schmidt said, is tailored to support the next generation of engineers and architects. The firm designed an atrium specifically for testing unmanned aircraft systems, also known as drones. FSB also identified ways to make the building itself a teaching tool, something the firm strives to do in any facility where students are studying one of the STEM disciplines. At the engineering school, this was achieved in creating suspended bridge-like walkways with adjustable stiffness. Engineering students will be able to adjust the walkways and observe the change, from springy to rigid, a real-life demonstration of concepts covered in their physics courses. Education Market Principal, Dennis Glover, AIA, LEED AP BD+C at education@fsb-ae.com or directly at 405.840.2931.